The waist on these chaps is adjustable with the belt in front which has a wide adjustment range, so the waist can be adjusted to fit most anybody if the chap size is chosen correctly based on the thigh. For example, the waist belt on the size XL chap can be adjusted from 35” to 44”. The most important measurement is the thigh. Measure your thigh up high near the crotch where it is the largest. Then use the chart to choose the smallest size that is bigger than your measurement. And measure yourself wearing the clothes you think you’ll be wearing with the chaps. Inseam is a bit tricky in chaps since chaps don’t have a crotch seam, but based on what I see, the inseam is about 321” for the smaller sizes, about 33” for the mid-sizes and 34” for the largest sizes. This length should be long enough for the “average” height person, and then the legs can be cut or hemmed to the ideal length. Before you hem, make sure to sit down to get the desired length while on a motorcycle. If the inseam sounds short for you, then these chaps probably aren’t the ones you need, and you should look for a chap that is available in a tall size. 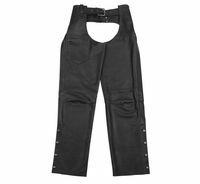 Black Brand says: Black Brand Degree leather chaps offer a classic look, easy access front pocket, an adjustable fit via back lacing and an extra-long belt. Snap closures and easily trimmed legs allows you to make the Degree fit perfect for years to come.